Unfortunately, that’s just not as true as it sounds. The Eagles are young, but the core of the team is actually reaching the end of their prime, with few replacements on the way. Let’s see… That’s three starting offensive linemen, including both tackles. Three starting defensive linemen. Three of the top four cornerbacks. Oh, and a $100 million quarterback. Even scarier, can you pick out any of these players and tell me who his replacement is going to be? The Eagles have no quarterback of the future. With Brandon Graham’s return from injury still an open question, they don’t have a single promising young linemen on the team ready to take over at offensive tackle or defensive end. Do you trust Dominique Rodgers-Cromartie at cornerback? What about Brandon Hughes or Curtis Marsh? And it’s not like many other positions are bursting with young talent. With the possible exception of Brian Rolle, not a single linebacker looks like more than a backup. There are three young safeties, but none have them have shown they can play at higher than replacement level. Jason Kelce looks like a keeper, but his fellow rookie Danny Watkins isn’t exactly a spring chicken. The only place where the Eagles have proven youngsters is at the offensive skill positions. Unfortunately, it’s not clear how long that group will stay together. 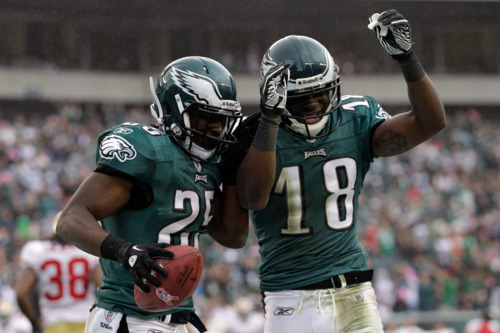 The DeSean Jackson departure appears imminent and Jeremy Maclin has never proven he can be a top wide receiver. Why the Eagles haven’t already thrown gobs of money at LeSean McCoy is beyond me. It’s discouraging to glance up and down the Eagles roster. The short term outlook is bleak, with this season likely to go down as the worst in Reid’s tenure. And as to the future… there just isn’t much to look forward to. Almost two seasons have passed since I wrote about Reid’s third 5-year plan. So far, that plan has failed. Tagged with Philadelphia Eagles, NFL, Andy Reid, Front Office, Trent Cole, Todd Herremans, Jason Peters, Nnamdi Asomugha, Joselio Hanson, Cullen Jenkins, Evan Mathis, Jason Babin, Asante Samuel, Michael Vick, Brandon Graham, Dominique Rodgers-Cromartie, Brian Rolle, Jason Kelce, Danny Watkins, LeSean McCoy, Jeremy Maclin. December 6, 2011 by Brian Solomon.